This is a sponsored post on behalf of Brummel and Brown Organic Buttery Spread with Yogurt. All thoughts and opinions are my own. Chances are if I go to a restaurant and I see brussels sprouts on the menu, they’ll end up on my plate. It’s kinda weird because as a kid I’d do everything I could to avoid them. Mushy, dull green and smelly is how I’d have described them 20 years ago. But definitely not now. I’d change the description to crispy, tasty, deliciously green and not in the slightest smelly, except for an amazing smell of fresh thyme on these! Usually I’ll always roast my sprouts just because it’s so easy and the high temperature keeps the sprouts soft but still with a bite, and turns all those tiny loose leaves charred and crispy. So what do you say to these healthy veggies tossed in a creamy, buttery spread when they come straight out of the oven? Yup, I combined Brummell and Brown’s new organic buttery spread which is made using plant based oils and organic yogurt with my roasted sprouts. I swear it looks buttery, tastes buttery, and spreads smoothly, but it’s made with yogurt! Seriously guys, as soon as I tasted it, I knew it would be perfect for my brussels sprouts. For extra flavor, I threw in a lot of chopped fresh thyme with some sea salt and black pepper and called it a day. It really doesn’t need much more than that. As soon as the sprouts were done, I transferred them to a bowl and added a few small dollops of the thyme infused buttery spread. A couple of quick air tosses and the spread had melted, coating the sprouts and making it almost like a thyme flavored buttery sauce! So easy, so tasty, and the perfect side dish for any main course. 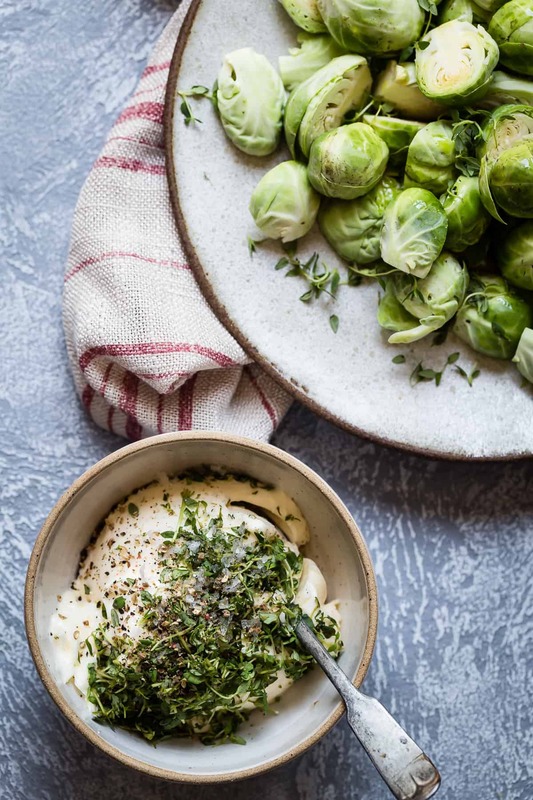 Here’s some other ideas for the thyme buttery spread just in case brussels sprouts aren’t top of your list for good eats. Just add some to these ideas for a whole new taste. 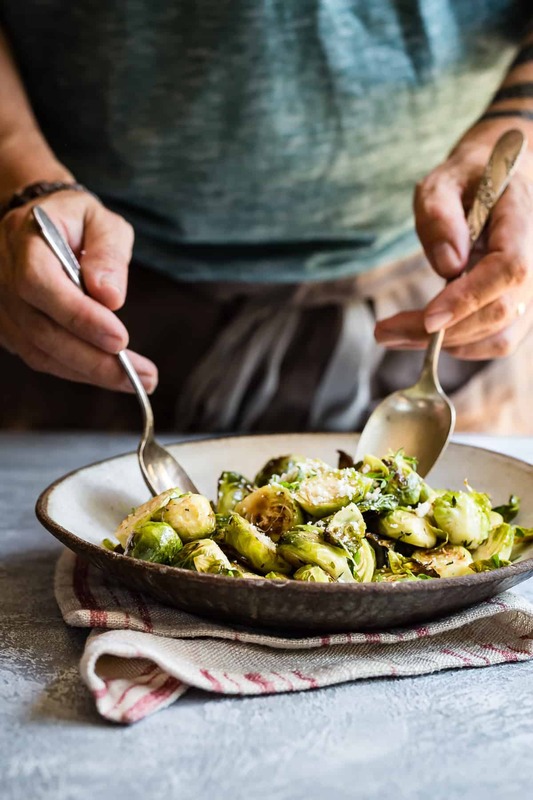 Delicious buttery roasted brussels sprouts are the perfect side for any meal! you and my husband have such similar taste buds. He’s part Scottish, I think! Ha ha ! He’d love these. Heck so would i! No way, I don’t think I knew that!! I just LOVE brussels sprouts! these look awesome- love all that fresh thyme! OMG yum! These look unreal! I need to try this! 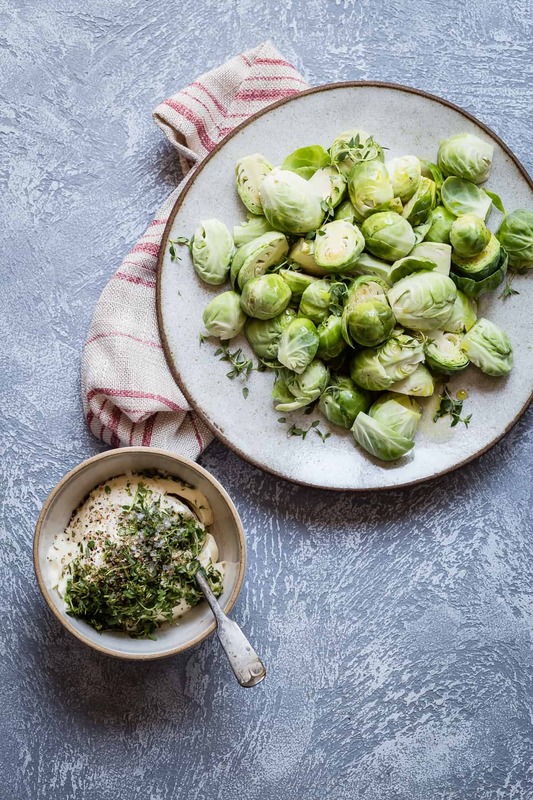 Loving the combination of brussels sprouts + thyme + cotija cheese! Brussel sprouts are my fav, too! And this buttery spread sounds so creamy and delicious! I’m drooling over here! Brussels are my favorite! Love! Love me some buttery brussels sprouts!! Roasted brussels are the best! Love this as a quick and easy side dish as we head into fall.